Fairway provides our advertisers with penetrating coverage of Minnesota with strategically positioned out-of-home media displays located on primary and secondary arteries. In Minnesota Fairway is located in Rochester, MN, 80 miles south of the Minneapolis-St. Paul area and 63 miles west of the Wisconsin border. Home to the world-renowned Mayo Clinic and the largest IBM complex under one roof! Minnesota is a state with above average growth in economy, one of the lowest unemployment rates in the nation and a job growth that is 33% faster than the rest of the US. 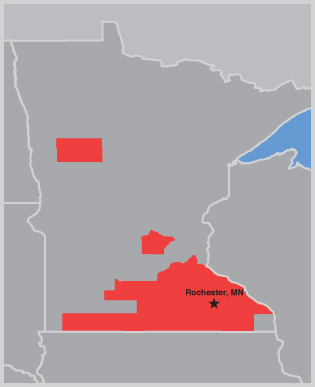 Rochester is the 3rd largest city in Minnesota and was named America’s best small city. Rochester has a strong economy and continues to rank high in quality of life and worker productivity. Shipping: Contact your sales person for shipping info.